Lowry Hill is a neighborhood located in Minneapolis, Minnesota. The community is named after Thomas Lowry, one of the neighborhood's developers and first residents. 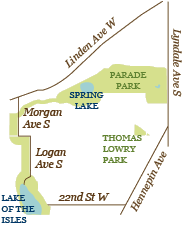 The Lowry Hill neighborhood is located west of downtown Minneapolis, enclosed by Interstate 394 on the north, Interstate 94/Hennepin Avenue on the east, 22nd Street on the south and Lake of the Isles Parkway, Logan Avenue and Morgan Avenue on the west. A popular recreational spot in the area is Thomas Lowry Park. This natural attraction offers benches and a small walking trail. Members of Friends of Thomas Lowry Park volunteer time and help keep the park maintained. Lowry Hill is also home to Parade Stadium, the Parade Ice Garden and the Dunwoody College of Technology. The largest school in the community is The Blake School. One of the best places to visit in Lowry Hill is the Walker Art Center and Minneapolis Sculpture Garden. Internationally recognized as a leading arts venue, the Walker Art Center presents contemporary visual arts and design exhibitions; dance, theater, and music performances; and film screenings. The Sculpture Garden, newly renovated and reopened in 2017, features magnificent, large sculptures in a beautiful garden setting. The population of this community is approximately 4000. According to the 2000 U.S. Census, the Lowry Hill neighborhood is home to 3,999 residents and 33 percent of residents own their own homes. Approximately 2,000 of our residents are age 25-44, 1,500 are age 45-64 and 500 are age 65+.